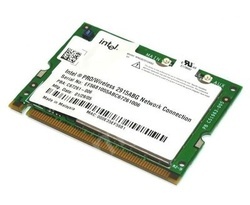 The Intel PRO/Wireless Network Connection is an embedded 802.11a/b/g MiniPCI adapter operating in the 2.4 GHz and 5 GHz spectrum. This solution is based on the MiniPCI Type 3B form factor designed to meet the space and size requirements for thin and lightweight notebook computer systems. reply to window 8 there is not?